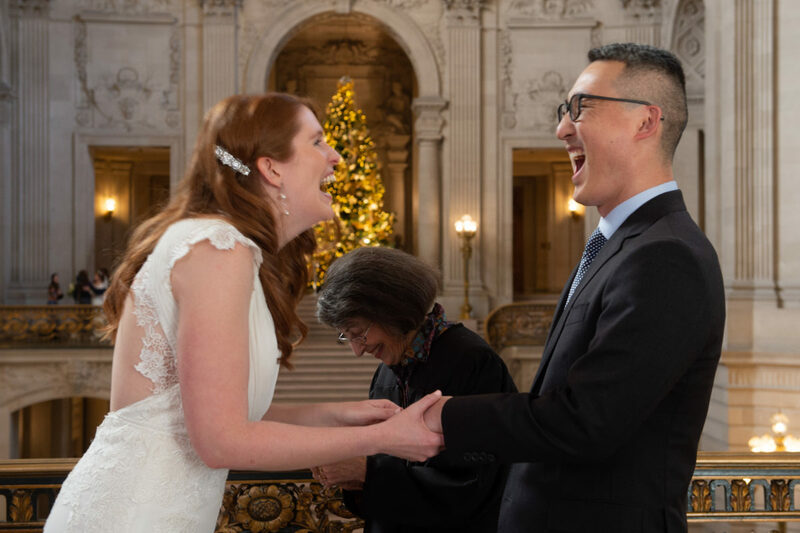 I am writing this blog post because we have had a number of brides at city hall show up without flowers. 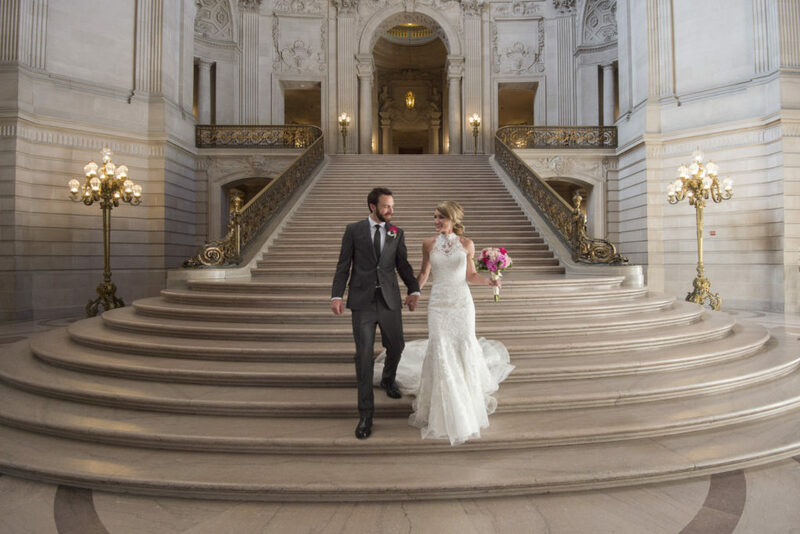 San Francisco city hall is an amazing place to have your wedding ceremony. The architecture alone is incredible but there is even more to this story. 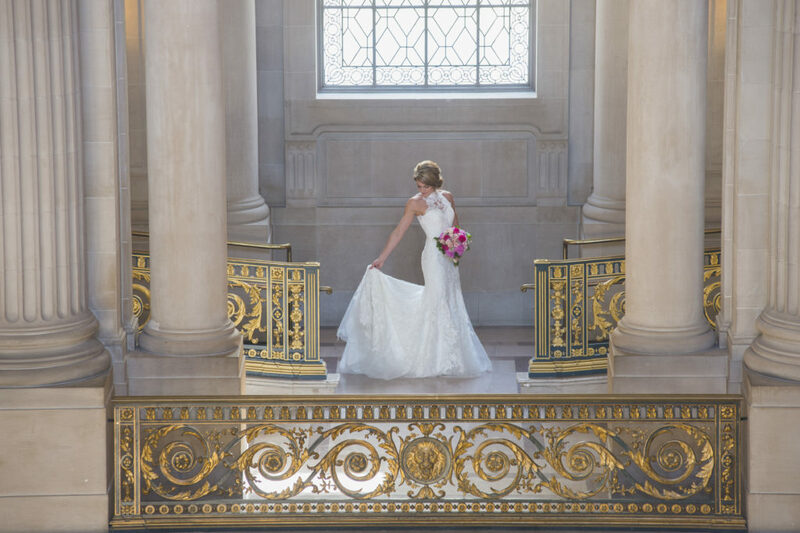 Because of the way the building is oriented, the natural light can pretty amazing at times. 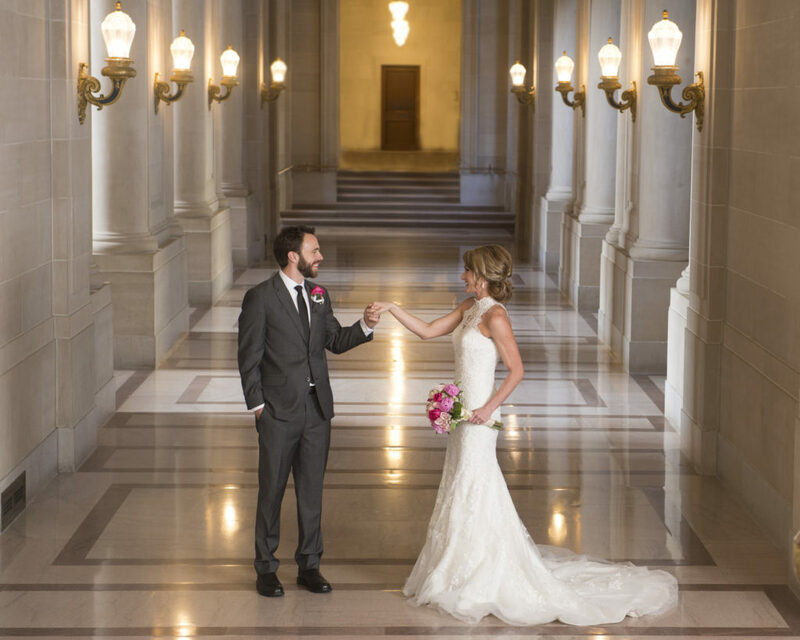 As a City Hall wedding photographer, you learn where to go at certain times of the day to capture this light. The windows are also incredible, not only because of the light they let in, but also the designs on the windows themselves. 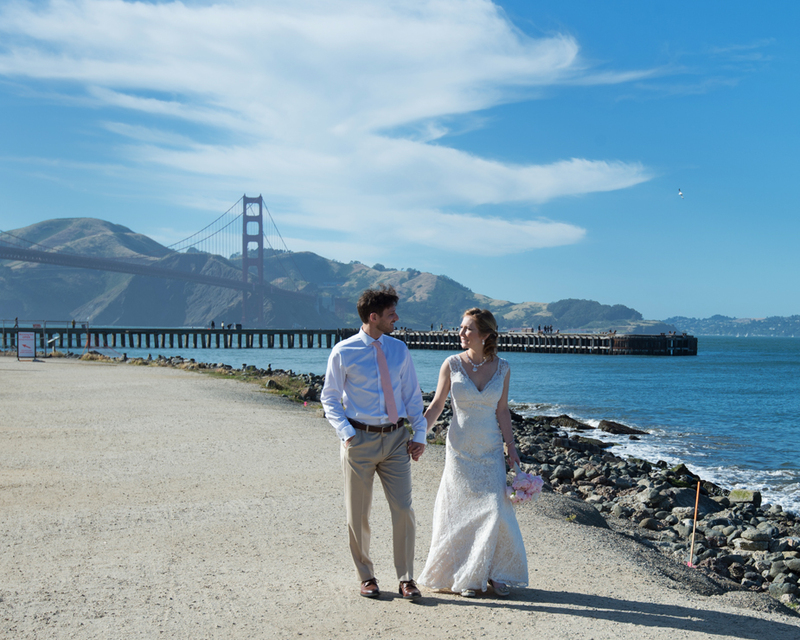 The only small problem with photographing weddings here is that the backgrounds are all very neutral. You have a mixture of white and gray and many shades in between. For this reason flowers make an incredible difference. 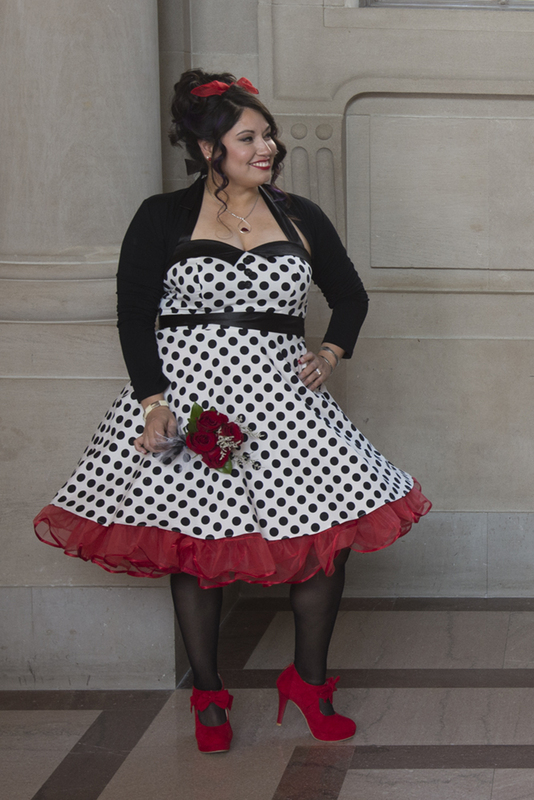 Just adding that little splash of color can really enhance a wedding photo here. 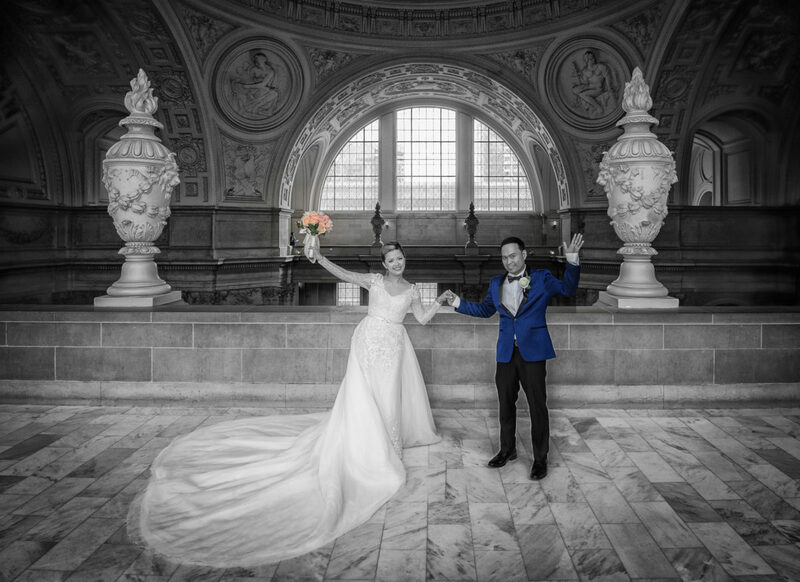 As you can see from the above photo, the image is enhanced by the color added from the bride’s bouquet. 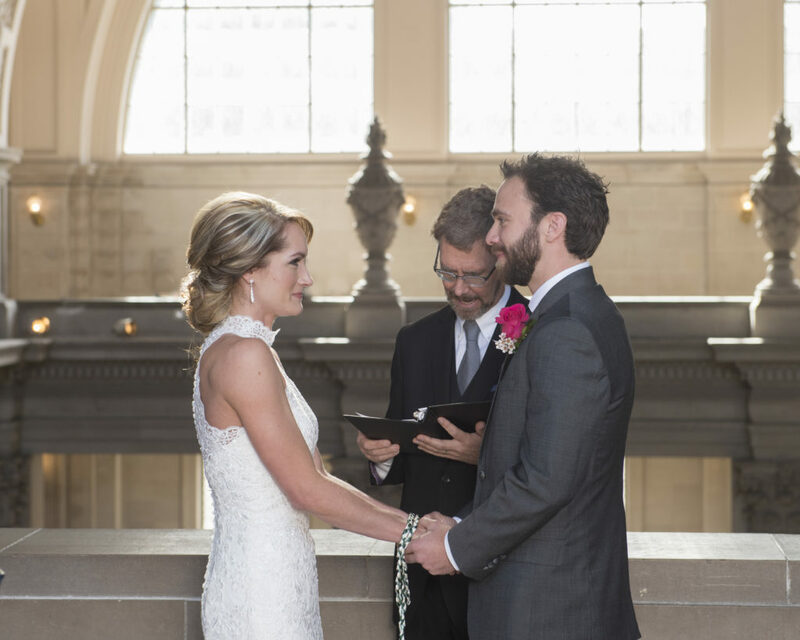 Even the boutonniere worn by the groom makes a difference. 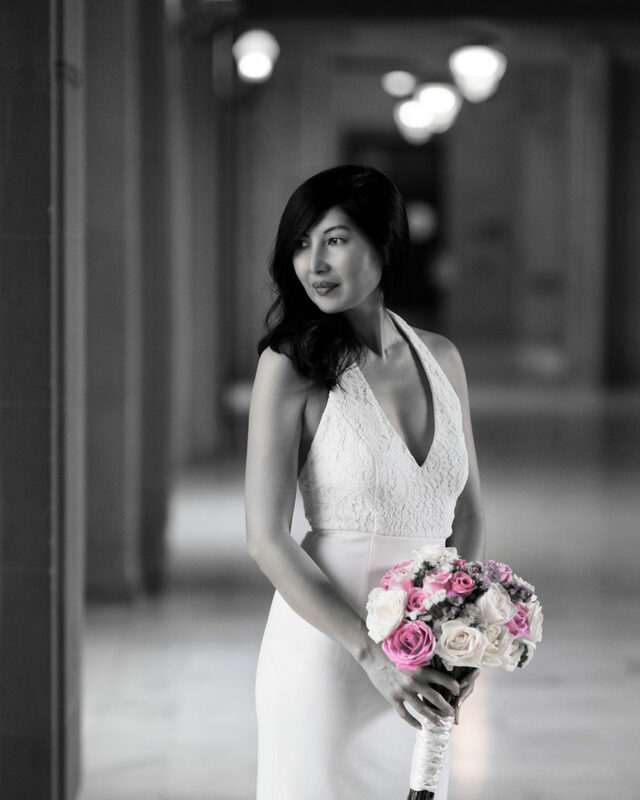 We are able to produce wonderful images even without flowers, but we highly suggest you consider bringing even a small arrangement. 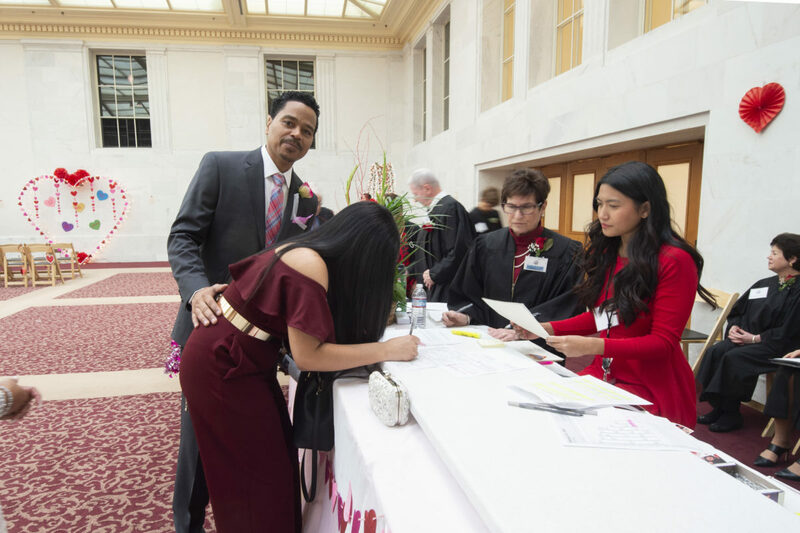 I honestly think that some City Hall brides dont even think about the possibility of flowers because its a civil ceremony. 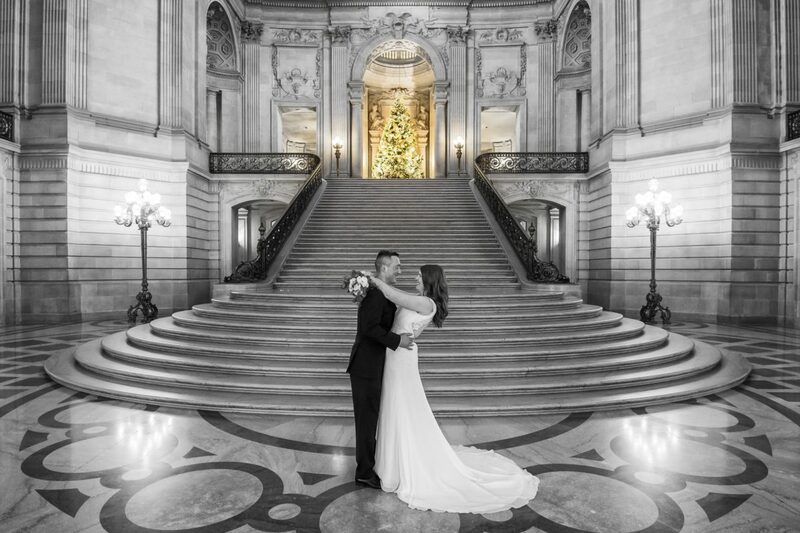 But San Francisco city hall is so different because of the elegance of the building! 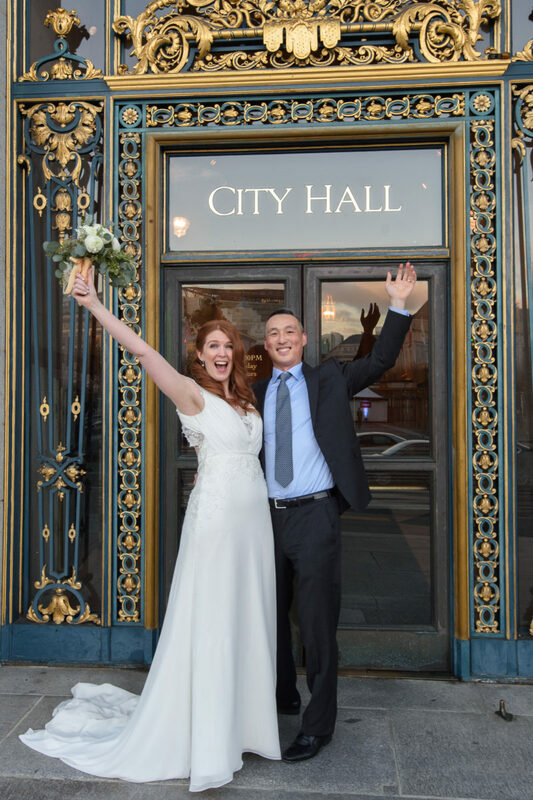 Here is a link to a city hall florist that we have liked in the past just in case you need ideas. 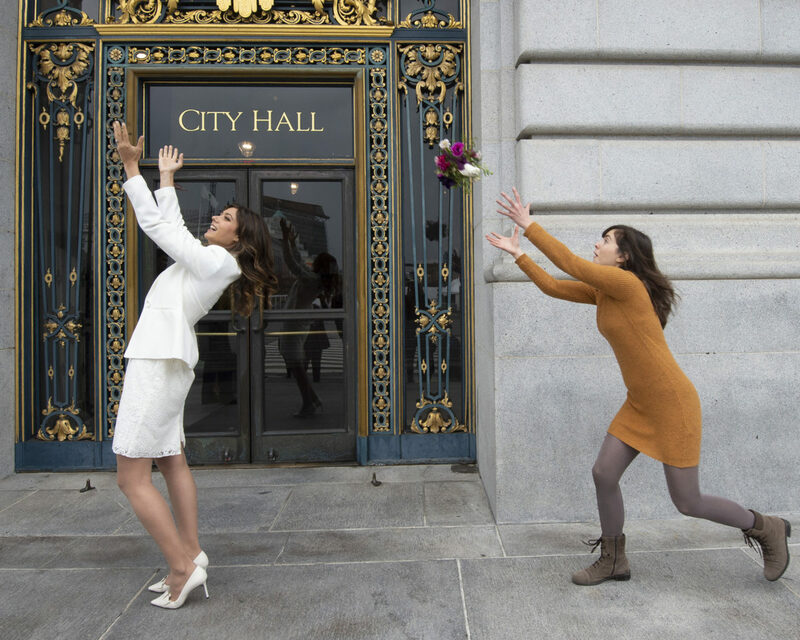 Another fun thing about bringing a bouquet to your city hall wedding is that you can throw it! Its kind of obvious who was going to catch it this time, but still a fun shot. 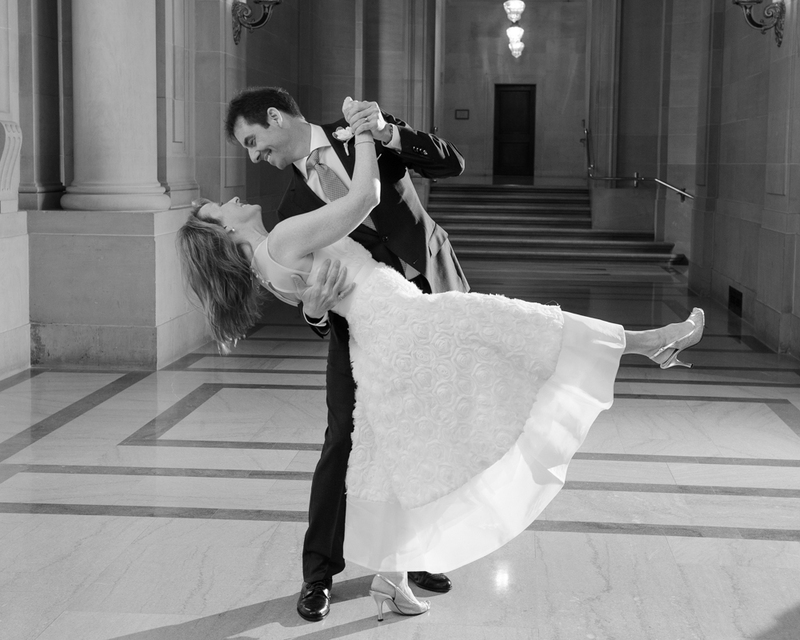 For more information about our SF City Hall Wedding Photography service check out our Yelp Reviews. We feel that it is more important to carefully read the reviews than to look at the rating. 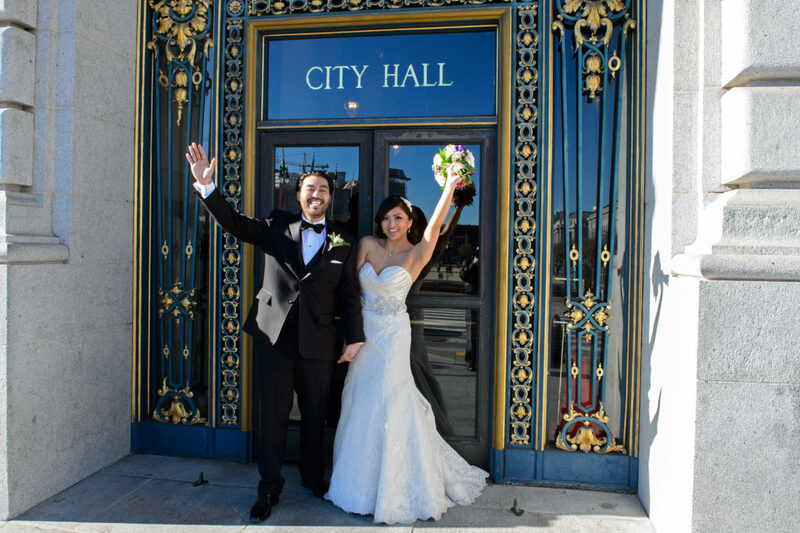 We always try to help our brides and grooms out with the process of getting married at City Hall and this is reflected in our Reviews. 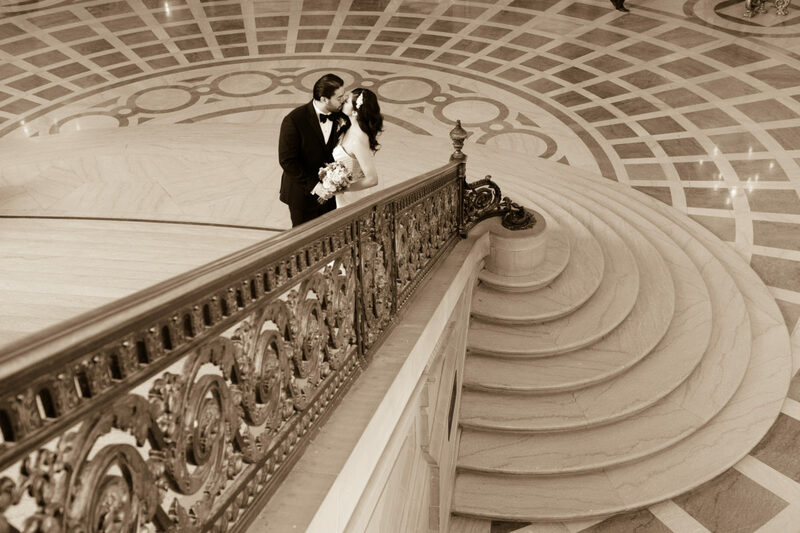 Providing advice on flowers is just one aspect of how we try to assist our Newlyweds. 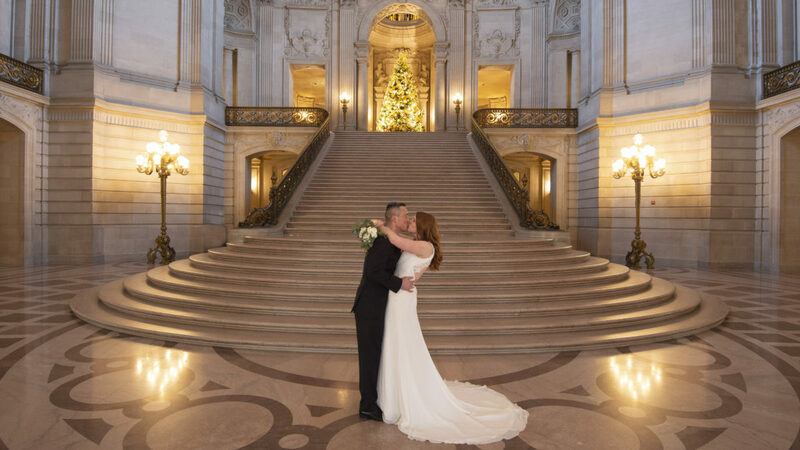 Another amazing bride and groom at San Francisco city hall. 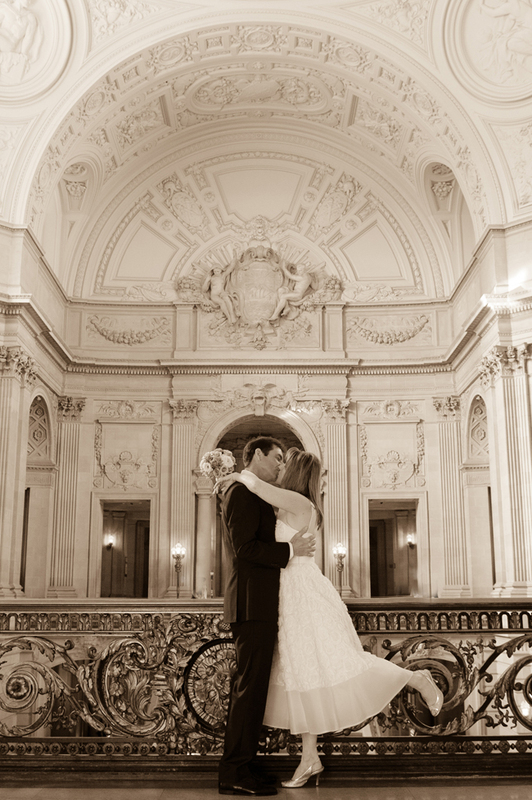 Katie and Kyle reserved the 4th Floor North Gallery to allow all of their guests to sit down in chairs. 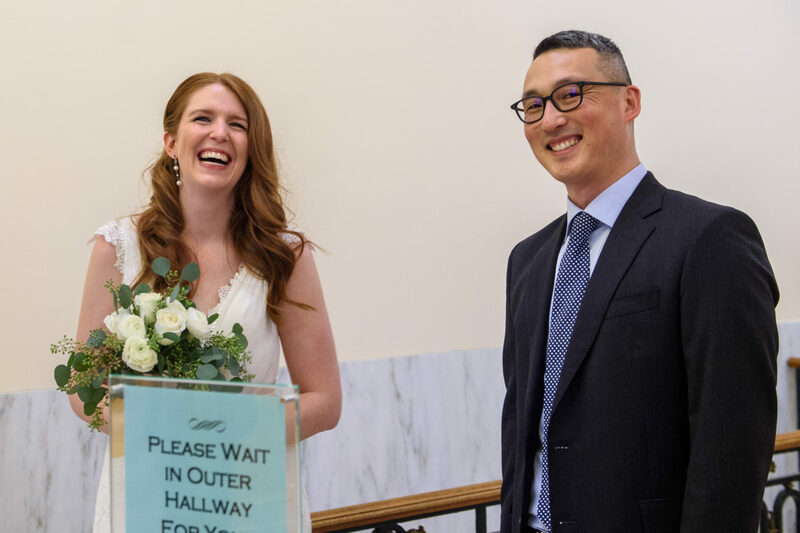 They also roped off the entire side of the floor to allow the bridal party to have privacy from other weddings and tourists. The cost for this is $1,000 for 1 hour of reserved time. They did a traditional wedding procession with the bride being led into the ceremony by her parents. The happy groom watching as they came in. 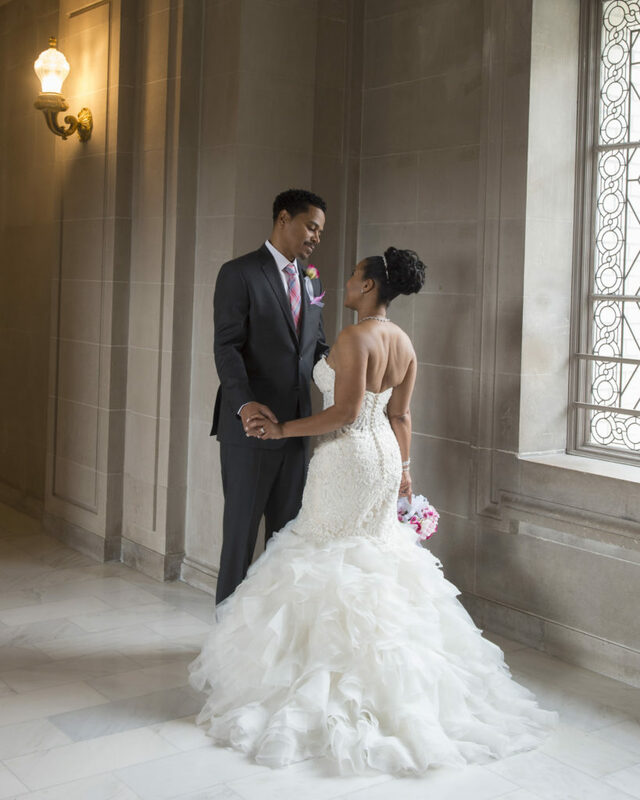 After a 20 minute ceremony and romantic vows, the couple was married! 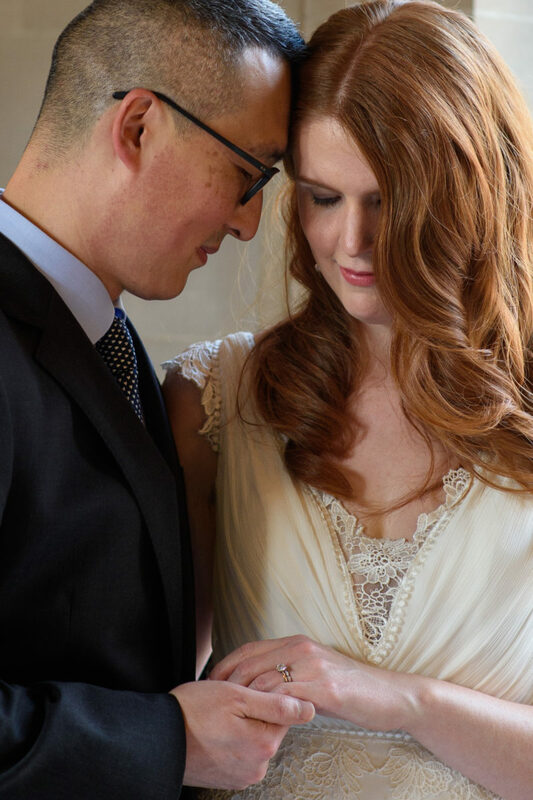 The bride was very well prepared with a list of family photos that she provided us. We love it when the couple can give us a predetermined list of family groupings. 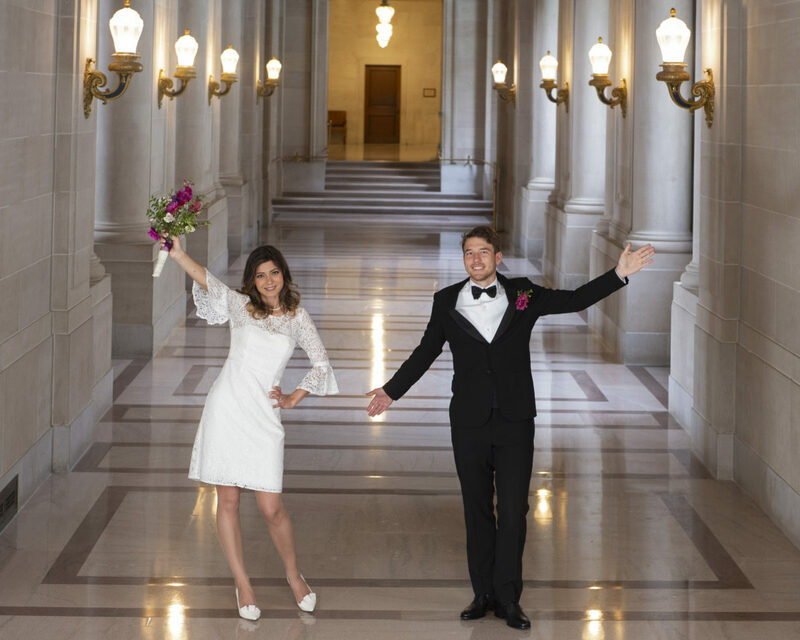 It truly makes that part of the wedding go much fast allowing more time for bride and groom formal photos. 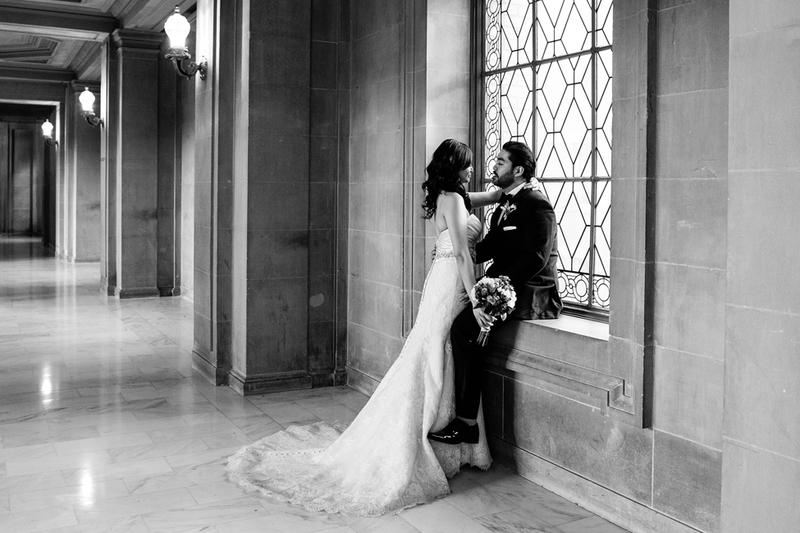 We began our shoot once we completed the family portraits, taking the couple around the building on what we call our “city hall photo tour”. 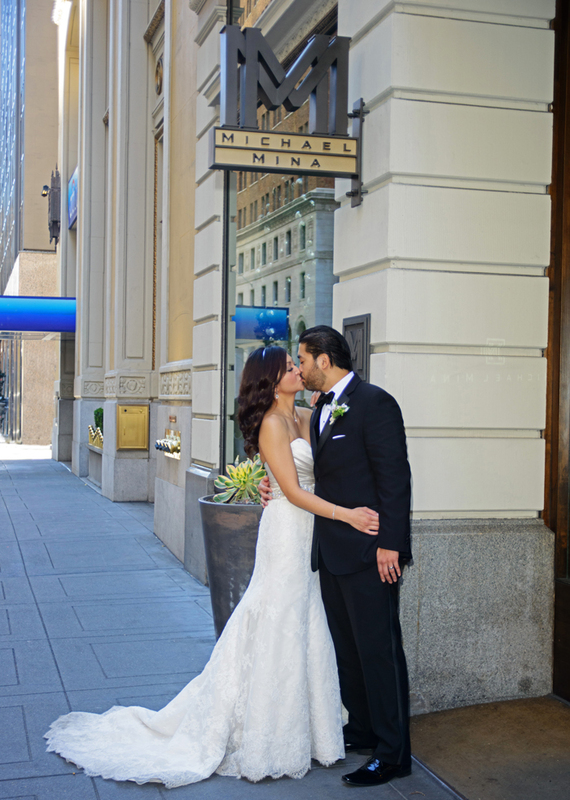 See below for some sample photos of our wedding photography shoot. 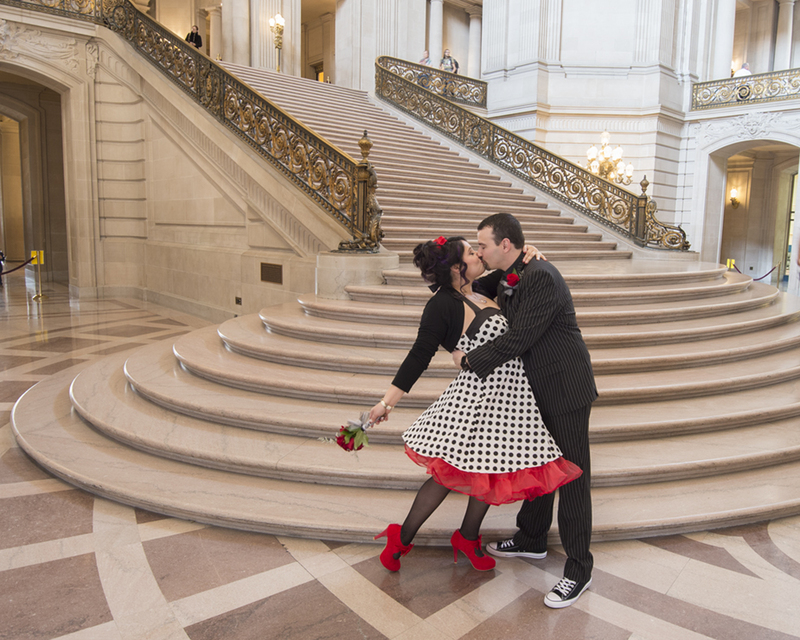 We spent around 45 minutes going from floor to floor at San Francisco city hall and taking pictures at many of our favorite locations. 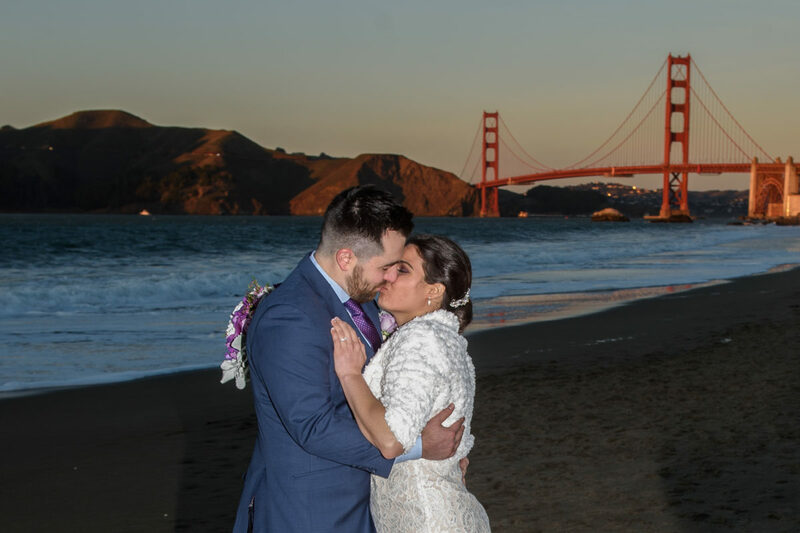 It was unseasonably warm for an early February wedding so we took it slow to keep our bride fresh. We were also quite pleased with the lack of crowds for a Thursday. 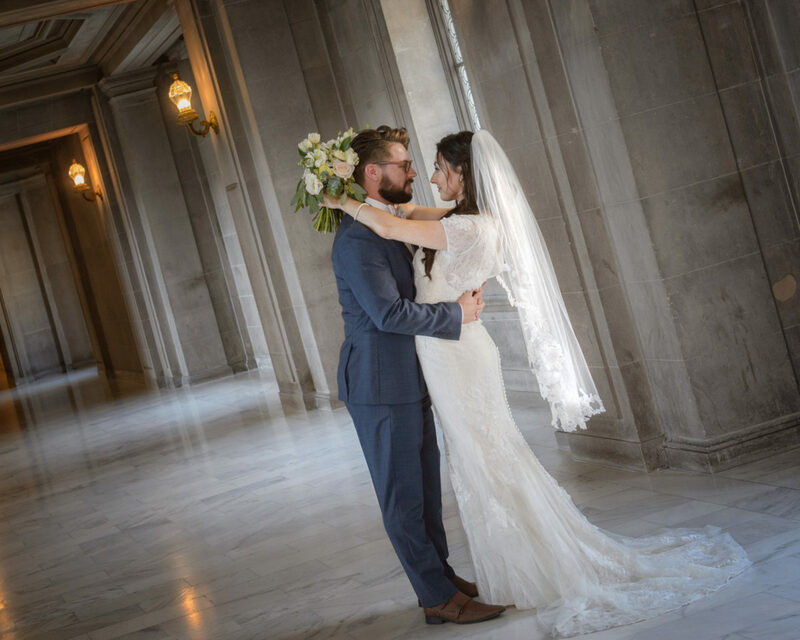 Normally Thursdays are the second busiest day at city hall, but early February is a slower time here and we were blessed with no crowds and the opportunity to get some great images. 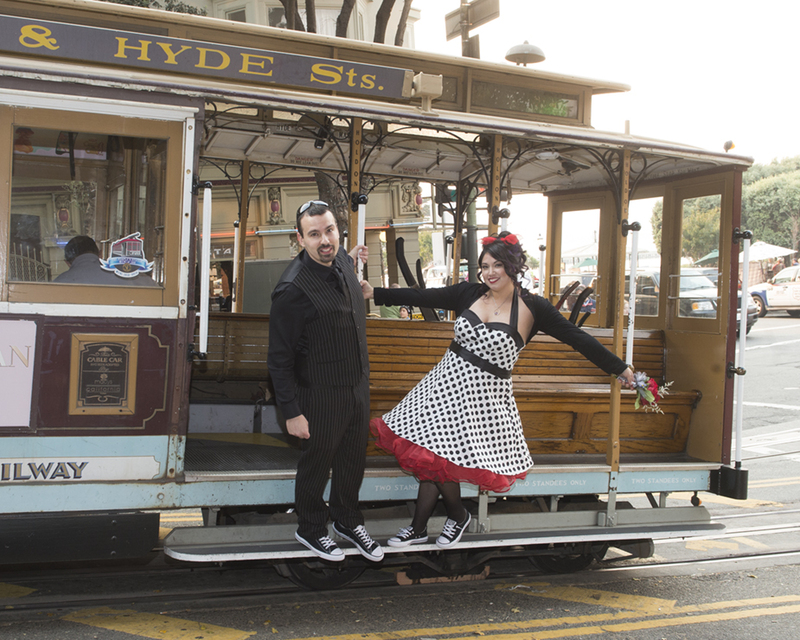 With both the bride and groom letting us know that they were athletic, we asked them if they would be willing to do a lift shot. 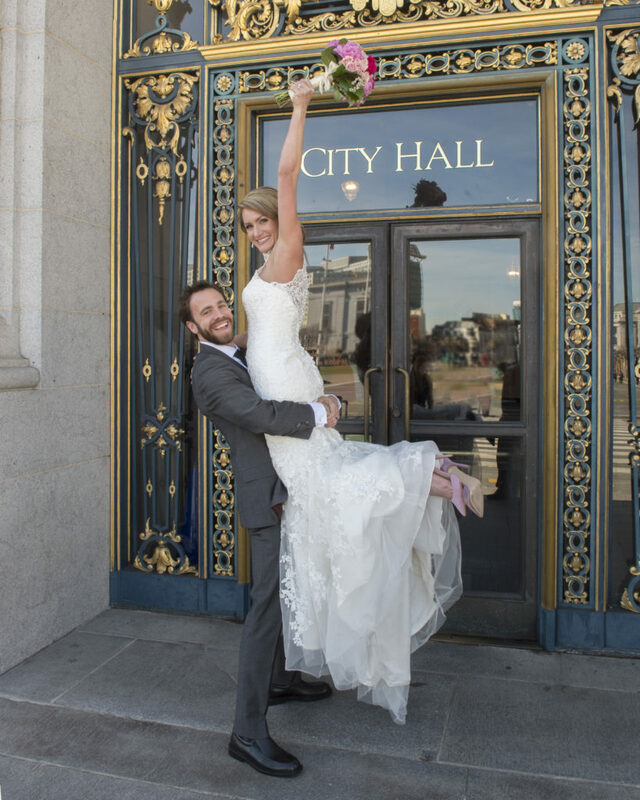 We wanted Kyle to pick up Katie and lift her high in the air in front of the city hall sign. Here is the fantastic result! 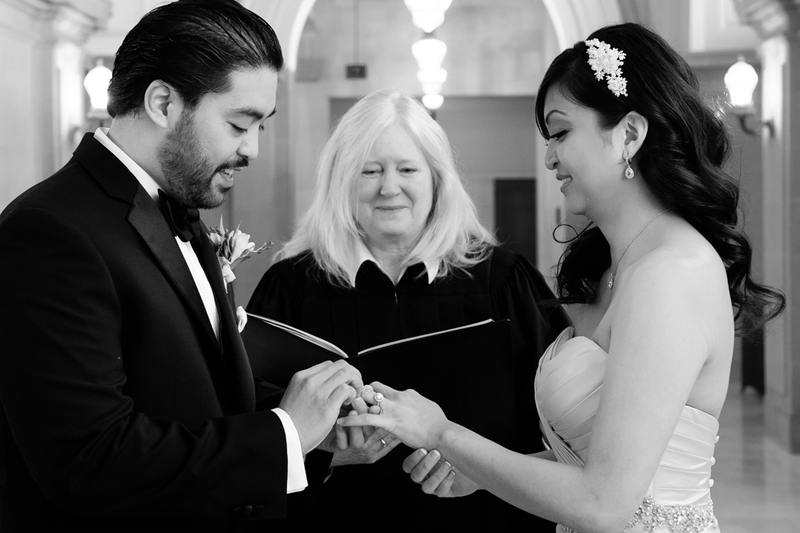 We really enjoyed this wedding and helped this couple make memories for years to come.